Your Holi Is Incomplete Without These 5 Mouth-Watering Traditional recipes! We thought of sharing some traditional Holi recipes with you, our readers, so that you can also indulge in them and share the sweetness with your near and dear ones. Try them now! Holi is round the corner and what better way to celebrate the festival of colours than by eating delicious gujiya, dahi vada, shakkar paare and other lip-smacking sweat meats. Holi is all about celebrating the victory of good over evil and this is what is signified when you burn holika or wood logs on the eve of Holi. This year due to the Maharashtra drought people have been urged to have a dry, waterless Holi. While that is something you must do as an earnest Indian citizen, no one is stopping you from having those delicious Holi sweets. That's why we thought we should share some traditional Holi recipes with you, our readers, so that you can also indulge in them and share the sweetness with your near and dear ones. Try them now! 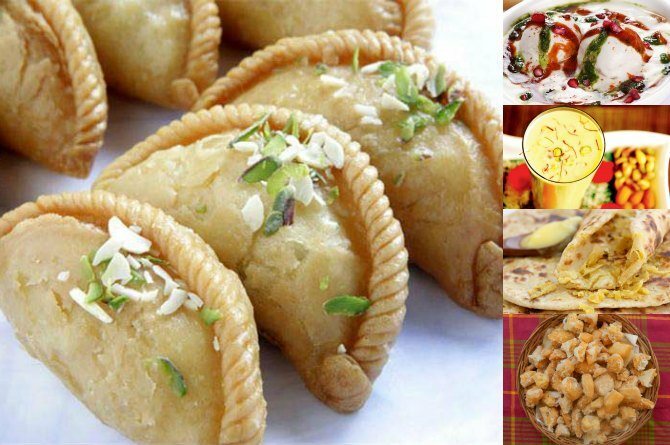 Holi is incomplete without the traditional gujiya that can be a little difficult to make sometimes due to the effort that has to be put in. However, this video shows how you can make chandrakala gujiya, which is a little different from the usual gujiya and is not easily available in the market. Learn how to make tasty gujiyas in the easiest possible way in this video. People up north would agree that Holi celebrations in their homes is incomplete without a bowl of yummy dahi vadas with the tangy red imli chutney. Makes your mouth water, right? While easy to make, it can be difficult to get the right consistency of urad dal to make the softest, melt-in-your mouth dahi vadas. If you face a similar problem, fret not. Watch this Sanjeev Kapoor video that neatly explains the step-by-step procedure of making the softest of dahi vadas in minimum time. Shakkar Paare are another common holi sweetmeats, which is liked by everyone. While making shakkar paare also one has to be careful with the consistency of the chaashni or sugar syrup as a little here and there would lead to either rock-hard shakkar paaras or ones that are too soft for your liking. This video shows you the things that you should keep in mind when making shakkar paare. Thandai is a holi speciality for some and requires a lot of preparation to make. It's nothing but a cold drink made of a mixture of almonds, fennel seeds, magaztari (watermelon) seeds, rose petals, pepper, cardamom, saffron, milk and sugar. While making thandai again one has to be very careful about the right quantity of ingredients, failing which it would not have that refreshing taste. Know the step-by-step procedure to make it in this video. No festival in Maharashtra is complete without the delectable Puran Poli, which is why it is a must during holi as well. Puran Poli is made out of chana daal and flour and has a sweet, delicious taste. It can, however, be a tedious task to make the poli (the bread) as soft as possible using the right amount of daal filling (puran). This video shows you how to master the art of making the softest puran polis at home like a pro. Sneak peek: Here's how Aaradhya Bachchan is going to celebrate her 5th birthday!